Pelin wrote: Though PSG's pacey wingers gave hard time to us, Yacine Adli is the one we should watch. Nice talent. I know that he is the leader of U17 France team,because they played couple of friendlies against Bulgarian U17 team,and the comments about him were unbelievable good. I appreciate the knowledge you gave us, IsiahRashad, but at the same time I refuse to watch a video titled "THE FRENCH FELLAINI". I mean, what the heck? Apologies to any Belgians or closet Man Utd fans on the forum. I want no fellaini in my team..
MUTU wrote: I appreciate the knowledge you gave us, IsiahRashad, but at the same time I refuse to watch a video titled "THE FRENCH FELLAINI". I mean, what the heck? Apologies to any Belgians or closet Man Utd fans on the forum. It must be because of his hairstyle. Some sources says that he will prefer Barca or Bayern depending on their sporting project. The other sources says that Bayern entered too late for him. On the other hand, PSG's Henrique has good relations with Kia, who is Adli's agent, so they can still keep him. 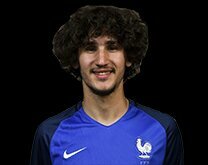 Yacine Adli is probably the best U17 French talent. He is a creative mezz'ala, who also can play as RW. His game looked matured for his age.His passing and vision really impressed me. I know that's a highlight video but wow. I really want us to get him.